Da Gino Ristorante Italia (475 West Georgia St, phone (778) 371-7355) is a welcoming Italian restaurant across the street from the Vancouver Main Library downtown. The pristine white tablecloths, wine glasses, and suit-attired servers gave me the impression that this is a “fine dining restaurant” but looking at the prices I was pleasantly surprised. For lunch, entrees were in the $10 – 14 range, and for dinner I think they aren’t much more. I really enjoyed my clam linguini (which had another, fancier Italian name which I can’t remember). 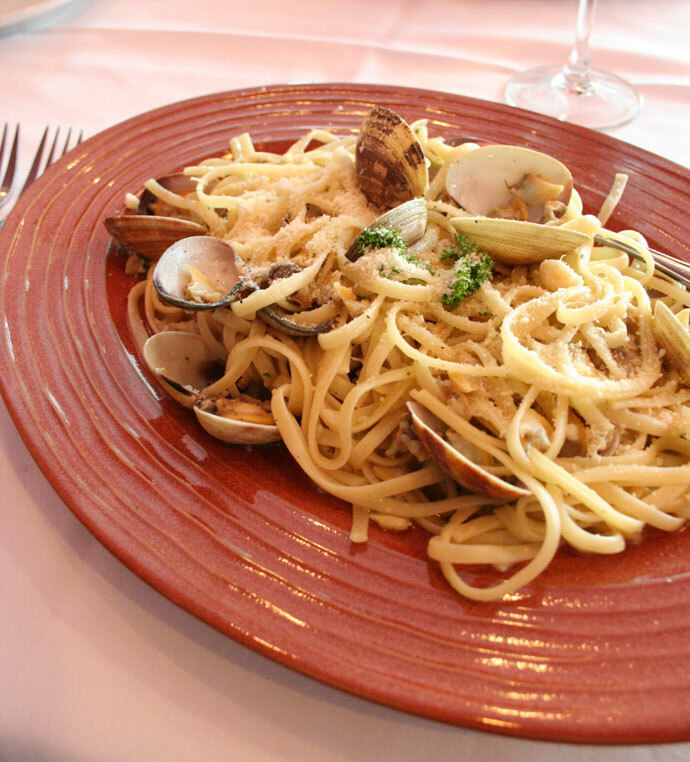 Clams were served in their shells on a bed of perfectly al-dente pasta. Yum! 16,171 views. This entry was posted on Saturday, June 23rd, 2007 at 7:44 am	and is filed under Downtown, Fine Dining, Food Photos, Italian, Pasta, Reasonably Priced, Restaurant, Seafood, Vancouver, Vancouver Restaurants. You can follow any responses to this entry through the RSS 2.0 feed. You can leave a response, or trackback from your own site. very very good and great prices will def. make me a regular at this restaurant…. First time today…….all 4 people in our party loved it!! !